1). Trying to locate previous owner ( A Mr Crump of Burnham-On-Crouch Essex). 2). Mr Brukett ( ex-WW2 ASR crew) is contacting Duxford/National Maritime museum etc to see if they can take her. 3). We may have located a local chap with a Tug & lighter that is big enough to take her. They sink the lighter and in theory, at high tide, 145 could float onto the lighter for transport. A local shipwright was not too optimistic about making her watertight but says it is 'doable' If she was pulled 20 yards forward, she would be on hard ground and not in the mud. Any remedial work could be done there so she could hopefully float. Robrina is a houseboat in Shoreham and HSL2548 is abandoned ( but still owned by a Spanish local!!) in Spain. 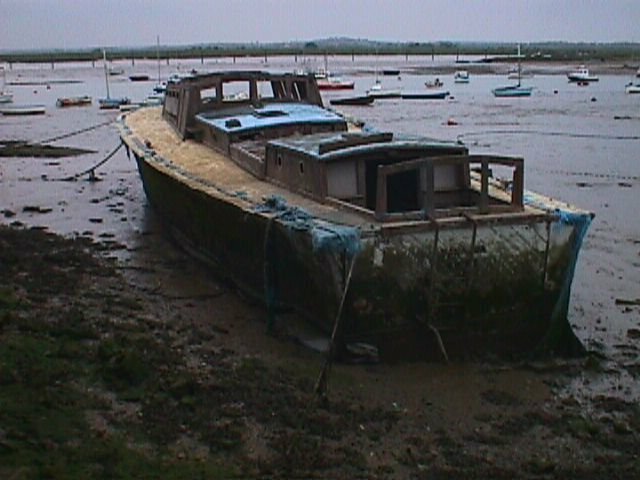 Is there anyone who wants to help with saving this boat or has any ideas of where she could find a home. Not sure about the possibility of moving her forward though , if it can be done without ripping her apart , then yes it would be better to be out of the mud , but will the hull take the pressure ? Dragging her on to the hard sounds attractive, but I think that it could be extremely risky. Where can she be pushed and pulled from which can be relied upon and reasonably sound. Also protection for the boat on the ground would be a problem. and she would try to twist as she comes on to the harder ground. The scope for causing a high degree of damage is high. Floating onto a barge could be much more kindly. I would envisage some form of cradle with at least 4 section, and ideally 8 or more, pre-mounted on to the barge with guide posts. Lock the sections to make sure that they do not move. Float the boat on and locate into the cradle where it can settle into shape for repairs. Cradle and boat can be fastened together for lifting, jacking and handling if moving off the barge. The cradle longitudinals and temporary deck longitudinals can be used to provide all of the longitudinal strength that is needed and can be from cheap builders tmbers and shuttering/sterling board. BMPT may have some records of the shapes/cradle that they originally used for the 63' Whaleback hull that used to be on their site. The owner may have some other information too. That is certainly worth a thought , but if we can shift a load of the mud from the bilges , without damaging the wood , she could be floated higher up the bank on the next springs , which I believe is early September . After clearing as much mud as possible , make good any leaks , then cradle float into a barge for moving . Well no update really. No location has been found that we could move her to. Spoke to a curator at Duxford and they have enough boats and don't plan to have any more. Has anyone any ideas on where she could be taken to? I have drawings of a HSL cradle somewhere that I'll dig out. I think it was on a set of John Lambert drawings. Anyone know what happened to HSL142? Did anyone get round to saving her or has she been broken? Well as I said in the beginning, my offer was to try to help get her out of the mud into somewhere dry for someone to restore her in the future. I thought the ASR group or Duxford museum might want her. No volunteers (other than Dave) to do anything and no one wants to take her, strore her or restore her. It's a real shame really but I cannot do it on my own. I'll donate £200 to the move to anyone who can take her and save her. Regarding 145, I can't contribute much to her salvation, she's clearly way to far gone for me to take on for all kinds of reasons but I live only ten miles from Mersea and would turn out to lend a hand moving her etc if anyone was brave enough to try. By the way that offer does include getting tired and filthy as part of the mud shoveling gang, just give me enough notice to keep the time free.